For many of us the daily commute is just part of life, a necessary means of getting to and from wherever we’re going. It has become so regimented in our daily routines that many of us don’t even hesitate to jump in our cars to drive the single mile to the gym. Driving is certainly a modern convenience, however, many of us are blinded by this and miss the serious negative impacts that driving has on our health, our environments, and our wallets. Numerous studies have indicated that there are some profoundly negative health implications from driving on such a regular basis. For instance, a study of 4,297 Texans found a positive correlation between work commute length and blood pressure rate. The study also found that the longer a person was commuting by car the less daily activity they were likely to get, resulting in higher obesity rates. All of these health factors are associated highly with chronic conditions such as cardiovascular disease. In addition to the aforementioned health risks of commuting, other research has found associations between driving commutes and back/neck pain, higher blood sugar and cholesterol. Mentally, the impacts are just as damaging, with studies indicating up to a 20 percent increase in anxiety levels and a heightened risk for depression. 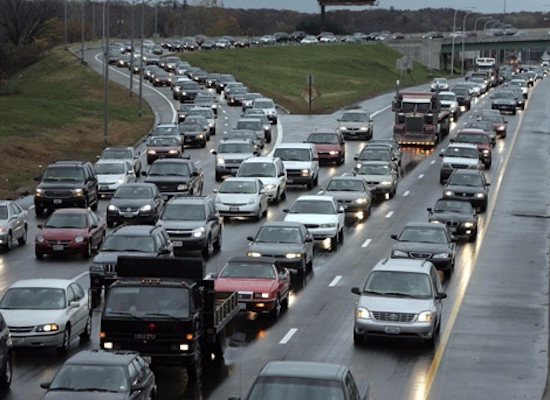 Every day approximately 151.3 million people in the United States alone have a driving commute to work. On average, they travel 12 miles or about 30 minutes each way. Although on a case by case basis this doesn’t sound like much, it has a profound impact on the environment. However, transportation alone accounts for over 15 percent of global greenhouse gas emissions. Research has shown that vehicle emissions has severely affected our ozone levels and helped contribute to the ongoing global climate change phenomena. Furthermore, it has been shown to alter the air quality significantly enough to influence the breathing capabilities of living things. Research out of the University of Southern California’s Public Health Department has shown that children and young adults that grow up closer to busy highways actually have a reduced lung capacity. Different studies have also linked vehicle emissions to increased asthma occurrences. Driving everywhere also has a monumental effect economically. In 2014, the average family spent approximately $2,700 on fuel to drive places alone, which is a huge expense for many. Furthermore, with consistent waves of high and higher gas prices, many individuals are limited in their abilities to pay other bills which causes a whole host of additional economic problems. Luckily, there have been recent efforts to reduce both the need for and impact of commuting. New federal vehicle regulations are enforcing the development of more fuel efficient cars on the road. There has also been a movement towards the development of transit-oriented development, or construction with alternative means of travel in mind. More and more people are choosing to travel through alternative means such as walking, biking, or carpooling – according to the Sierra Club, if every US driver made one four mile trip every week by bike they would save nearly 2 billion gallons of gas yearly. That’s not to mention the all of the health and environmental benefits that come with the package.